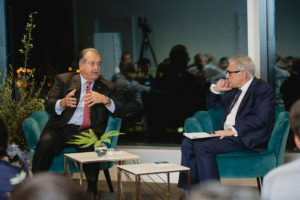 The Hellenic Initiative Australia hosted a special event in Darwin on Saturday 10 November 2018 featuring global business leader Andrew Liveris AO, former Chairman and CEO of The Dow Chemical Company, in conversation with journalist and TV presenter John Mangos. Held in the new Charles Darwin Centre, the landmark 21-level Paspaley headquarters, the event was attended by key Darwin political, business and Greek community representatives, including the Deputy Chief Minister, the Hon Nicole Manison, the Leader of the Opposition, Mr Gary Higgins, Attorney-General & Minister for Justice, Hon Natasha Fyles and the Lord Mayor of Darwin, Hon Kon Vatskalis. 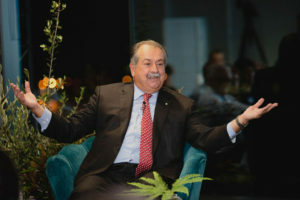 It was a special homecoming event for Mr Liveris, the Darwin-born son of Greek immigrants who retired from Dow in July 2018 after 40 years, having completed last year’s historic $130 billion merger between Dow and Dupont. guished members of the Darwin community to support The Hellenic Initiative’s efforts to assist the people of Greece,” said Nicholas Pappas, the President of The Hellenic Initiative Australia. As well as sharing personal insights into his extraordinary international career journey, Andrew N Liveris inspired attendees with his frank and compelling commentary on today’s key global issues and challenges for business and government, including energy policy and innovation. Mr Liveris also reflected on his Greek roots and abiding love for Greece, which led him to co-found The Hellenic Initiative in 2012 as worldwide diaspora effort aim ed at assisting the people of Greece through the economic crisis and aiding the nation’s recovery and and renewal through initiatives supporting economic development and entrepreneurship. Mr Pappas commended John Mangos for his outstanding job facilitating the discussion and thanked Theona Mitaros, a former Channel 9 Darwin newsreader, for hosting the evening. The Hellenic Initiative Australia thanks Event Sponsor, Jalouise, for supporting the event. Proceeds from the evening will support The Hellenic Initiative Australia’s programs in Greece.